Meopta were formed in 1933 and produced cameras and other precision lens equipment. They are still famous today producing military and weapon optics. The Meopta Meoskop viewers were produced in Bratislava, Czechoslovakia in the 1960's. They will take normal View-Master reels but were really designed to take Meopta manufactured reels. There is reputed to be a Meoskop I model, but the author of this web site has never seen one and neither have his contacts in the former Czechoslovakia. 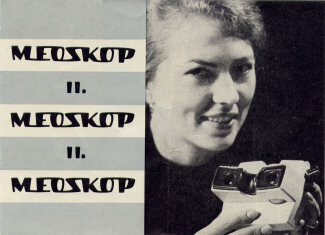 Until such time as evidence can be found for its existence, it is to be assumed that the Meoskop II was the first production viewer from this company. Meopta reels use Gottwaldov colour film, as opposed to Kodachrome as used by Sawyers and GAF, and tend to fade badly with age. The images are also generally of a lower standard, however, many of the subjects of these reels are unique, showing a glimpse of life within the Communist block in the 1960's. This 1962 bakelite viewer is quite rare and can fetch reasonably high prices. In the right-hand view you can see the wheel that is used to allow the lenses to be focused. The viewer itself is quite heavy and together with its screw together design, give the impression of being an item of quality. A Meopta Meoskop III (bakelite) with Light Attachment. 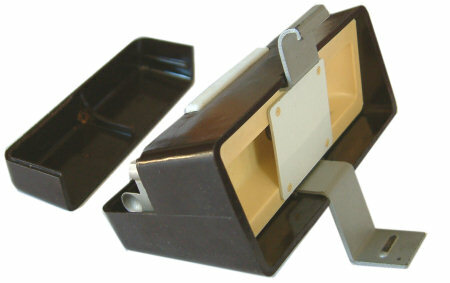 Based loosely on the Sawyers View-Master Model E, this bakelite Meoskop was manufactured in 1968 and can be seen with it's optional light attachment in place. This viewer gives a clean bright image which rivals any of the Sawyers viewers. The light unit is powered from 2 'C' size cells. It has a magnification of x5.5, producing a larger image than most View-Masters (Except the Model D). The lenses are optically very good and the viewer is well constructed. By removing the four screws it can be taken apart for internal cleaning. Another Meopta Meoskop III in bakelite but this time in a rare and unusual maroon colour. The model shown below is a later version Meoskop III . Whilst it looks identical to the viewer above it is, in fact, made from plastic rather than bakelite. The Meoskop 5 is grab-light viewer from 1981. It is comfortable to hold, feels robust and performs it's function well, giving 6x magnification. This lapel pin dates from the 60's. 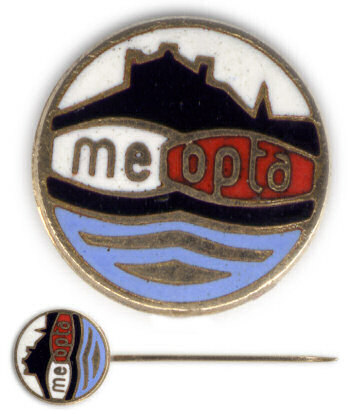 In the centre is the familiar Meopta logo in two coloured halves, showing water in the lower half (assumed to be the Becva) and the silhouette of a town behind which is assumed to be Bratislava.